Hello, and welcome to the first annual (this probably won't happen every year so don't get your hopes up) TOURNAMENT OF LEGENDS! You and your fellow competitors have been pulled here from across the multiverse to fight in a competition for fame, glory, and probably some likes and follows! Now, what are the rules? You must create a legendary creature to represent you in the fights. 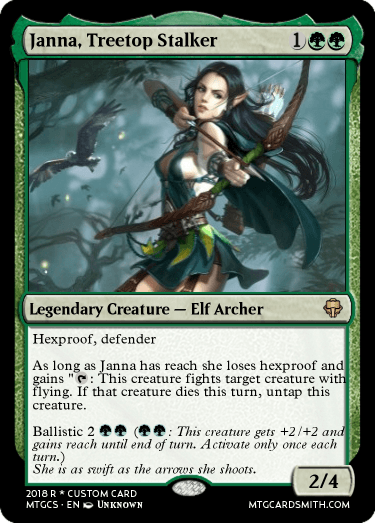 This creature must cost 4 or less mana, but will get better at this whole arena fighting thing after each round. 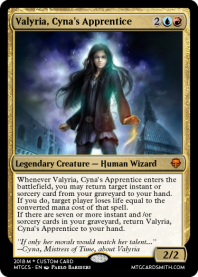 After the first round (if you win), you must make a new and improved version of your character, costing 5 or 6 mana, and having the abilities similar to the original. 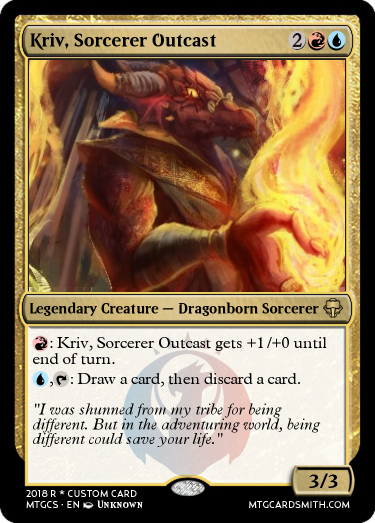 After that, your character will have been through enough that their planeswalker spark ignites, so you make a planeswalker for that character. Only one character per person! Also, color identity can change, as long as you keep at least one color from the original. The characters will be judged on a number of aspects, such as abilities, power/toughness, balance (a card that is TOO overpowered will not make it to the next round, so make them BALANCED! ), and just how cool they are! Also, if you want to give a description of your character telling their specific strengths and weaknesses, you can! This may give you an advantage or a disadvantage against certain other characters, but it is highly recommended that you do this! Also, remember to make the strengths and weaknesses BALANCED! I will be joining this contest too! I want to join in the fun! This is my character, one of the ones I have made for D&D! I will not be biased towards my character in the judging. If it is a bad matchup for me, my character will not advance. That said, if it is a bad matchup for your character against mine, don’t blame the fact that you lost on biased judging. In fact, I will give a short explanation as to why one character beat another for each matchup. Also, don’t say that I purposely created a matchup in which my character was favored. The pairs will be determined randomly. The deadline for the first versions of characters is August 20. I will be choosing 8 characters to compete (for a total of 3 rounds) out of all the entries. If you make it to the 1st round, your character’s card gets favorited. If you make it to the second round, you get 2 favorites. If you make it to the last round, good job. You get 3 favorites. Coolest card prize: The smith of the card I personally think is coolest (other than the winner) will get a favorite, a follow from me, and a mention in the Hall of Fame. Ok. So. Unless I get more entries soon, I will probably be closing the contest, because you can’t really have a tournament with only 2 people. Cool entry, though. @BorosPaladin Why is he a land creature? Also, what does it mean by a card that you did not play? Strengths: Agile, quick thinking, patient, not afraid of danger. Weaknesses: She doesn't know when to quit. EVER! She tends to be a bit reckless. Due to lack of entries, I am extending the deadline for first versions of characters to August 30. Strengths: Strong teeth, quick, small. 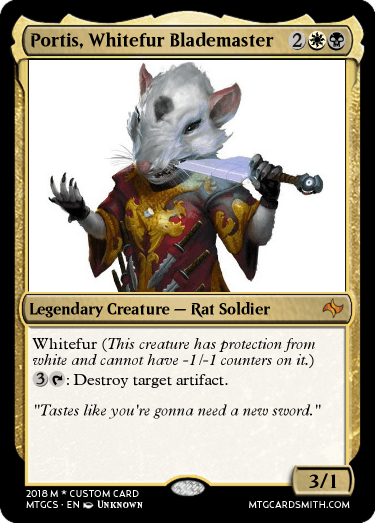 Weaknesses: Is shunned for being a rat. @ChaosStar http://forums.mtgcardsmith.com/discussion/809/tutorial-forum-post-coding#latest That’s the link to a post that shows you how to do all sorts of forum post coding. P.S. You have to scroll to near the top of the page to find the post on how to do image coding. Yeah, that worked. Cool entry! @Aggroman15 Why is he a land creature? Because I made a mistake i'll fix that. 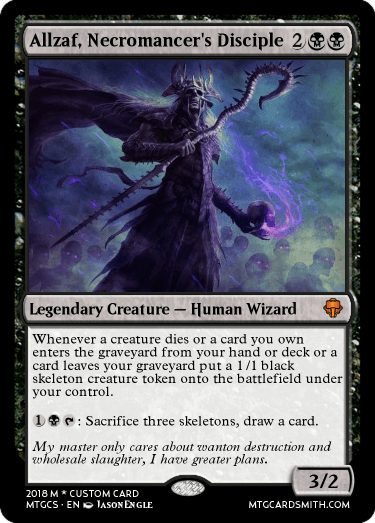 By a card you didn't play I mean if you discard a card or mill a card he makes a skeleton. I wrote it this way on the card because it was shorter and it still captures the meaning as cards you aren't playing are entering your graveyard, do you think I should change that? Maybe change it to “whenever a card you own enters your graveyard from anywhere but the battlefield or the stack” I added the last part for Instants and Sorceries. See if that fits. If it doesn’t, remove the flavor text. @Aggroman15 Thanks i'll implement that in the updated version. I just realized that there is a possibility that I would win my own contest, and that doesn’t really seem fair, now does it? So, if we get enough others, I am backing out as a contestant. And if not... welI, I’ll figure something out. @Aggroman15 We could always make second creatures as well? Then we'd have about 8 in total. We could say that they have to be a different color or something so there was some diversity. @ChaosStar The one problem I have with that is that there is the possibility of both of someone’s characters making it to the final, or being matched up against each other, so no matter what the person wins the round. I’m going to wait and see how many more entries we get, and then see what to do about any lack of entry problems. Strengths: Swift and turns into a Serpent when killed as well as the ability to clone in combat confusing the enemy. Transforms back into herself upon killing something. Weakness: Hates Ice when touched upon the skin. Struggles to move in high winds. @AggroMan15 The deadline is today, but we still need at least like 2 people. So I am not sure what we are going to do. @WickedShadow196 Earlier in the thread, I posted saying that, due to lack of entries, I was changing the deadline to August 30. Also, when I said strengths and weaknesses, I did not mean weaknesses and strengths of the cards themselves, like some of yours are. @AggroMan15 what do you mean by the strengths and weaknesses then? @WickedShadow196 The strengths and weaknesses of the character represented on the card, as that is who will actually be fighting in the contest. Some of yours are fine, but the “tokens are unaffected by return spells” and stuff like that should not be there. @Aggroman15 So I guess the Elerre the Wurm Mage would not work as it creates tokens. Weakness: Does not think of the future and will go all out to become powerful. Slow in an area of snow. @WickedShadow196 No, your character works. Making tokens isn’t a bad thing. I just need some strengths and weaknesses of the character. Making the thing that the token is could be listed as a strength, but s/w referring to actual MTG game mechanics (such as tokens, return spells, and instants/sorceries) is not allowed, as the character is the one fighting, not the card. Also, could I get more than just ice for the weaknesses? There has to be something other than just that. @SacredAnima could I get more on the strengths than just “smart”? @Aggroman15 Is it okay if I change Portis a bit? Due to Cardsmith limitations I left off the things I wanted for him, and he seems super weak compared to other cards. I just want to make him match his mana cost a bit better. @ChaosStar Yeah, you can change your character as much as you want until the deadline of August 30. @AggroMan15 does that fix it. Strengths: Small, quick, agile. Has very strong teeth, able to chew through metal. Very charismatic. Weaknesses: Not very bright. Shunned by most for being a rat.